We live enmeshed in networks. The internet, a society, a body, an ant colony, a tumour: they are all networks of interactions, among people, ants or cells – aggregates of nodes or locations linked by some relation. The power of networks is in their local connections. All networks grow, shrink, merge or split, link by link. How they function and change depends on what forms, or disrupts, the connections between nodes. The internet dominates our lives, not because it is huge, but because each of us can make so many local links. Its size is the result, not the cause, of its impact on our communication. Nowhere is the decisive influence of local interactions easier to see than in ants, which I study. The local is all an ant knows. A colony operates without central control, based on a network of simple interactions among ants. These are local by necessity, because an ant cannot detect anything very far away. Most ant species can’t see, and all of them rely on smell, which they do with their antennae. The important interactions are when ants touch antennae, smelling each other, or the ground, smelling chemicals deposited by other ants. The shifting network of brief interactions transforms a group of ants, each unable to assess any global purpose, into the orderly chaos that is ant-colony behaviour. In the tangled canopy of branches and vines in the tropical dry forest of the Estación Biológica de Chamela in western Mexico, turtle ants create and repair a circuit of trails that links their nests and food sources. The turtle ants never descend to the ground, so the trails can proceed only along a plant branch or stem. As each ant moves along, it puts down little drops of trail pheromone that quickly evaporate. Whenever an ant comes to a junction, where one stem crosses another, it chooses the path that smells most strongly of pheromone, which is the path that most ants took most recently. 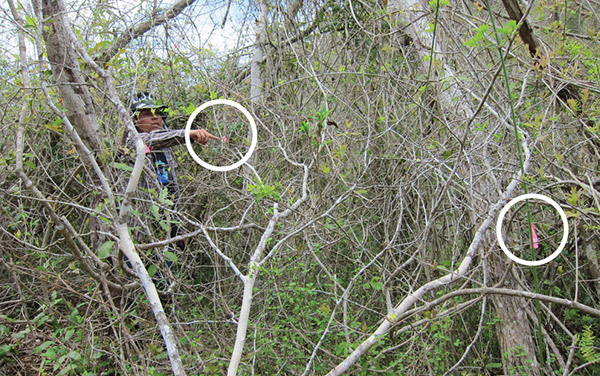 In this way, the trails of ants create a network within the network of tropical vegetation. A diagram of a turtle ant trail network over several days. Courtesy the author. In the jungle, the network of vegetation can be broken. A passing chameleon can wipe out many nodes’ worth of ant trail by breaking a cluster of delicate intertwined vines and branches. The ants’ nests are made in the tunnels of larval beetles, who prefer to burrow in soft, rotting wood, and the result is that the branches with nests break easily. The nest lands on the ground and the ants pour out, many carrying larvae and pupae, and head up the nearest tree in search of the trail. A researcher pointing to node 5. Nest 3 is circled on the right amongst the tangled vegetation in which the ants build their networks. Courtesy the author. In response to any break in the trail, the ants repair it by slight alterations in their local, node-to-node choices of path. A group of students and I marked ants with nail polish, and found that day after day the same ants tend to use the same part of the network. But ants can’t always go in the same place or they’d never find new food sources. By putting out baits a few junctions away from the trail, I learned that ants sometimes veer off the path and follow the branch that does not have the most pheromone. These local mistakes, taking a path that is not reinforced, are what make the whole network resilient. When the path is ruptured, some ants must abandon what has suddenly become a dead end. A few ants go to the node nearest the broken one and try from there to reach the original trail. (This is called ‘greedy search’ in the language of computer search algorithms.) Eventually the new part of the repaired path, linking the two ends of the original one, is reinforced by the ants coming from the other direction. Occasionally wandering off at junctions also allows the ants to find food, or shorter or less complicated paths, and prune unnecessary nodes or loops from the trail. Local interactions among ants are the key to effective search. Collective search always involves a trade-off between thoroughness, ensuring that nothing is overlooked, and covering ground, ensuring that the entire area is searched. Consider what would happen if you lost a diamond ring on a football field. If you have just a few friends to help you search, they all have to move around a lot to cover the whole field, but if there are many searchers, then each can search very thoroughly nearby. Argentine ants solve this problem by using local interactions to regulate their searching. They adjust their search paths to density. When there are many ants searching, each ant turns around a lot, almost at random. If there are only a few ants, they walk in straighter lines. The cue to density seems to be brief antennal contacts with other ants. The apparent rule is: ‘If I meet another ant often, I can turn around more. If I don’t, I have to walk in a straighter line.’ These simple interactions between pairs of ants function in the aggregate to adjust the scale of the network to the optimal size for the number of ants available. We recently asked another species of ant to solve this problem in microgravity, in the International Space Station (ISS). We sent pavement ants up to the ISS in small arenas with a barrier inside. To learn how the ants adjust their paths when density decreased, the astronauts opened the barrier, so that the exploring ants suddenly found themselves in a larger space where they met less often. The arenas were very shallow so there was not much room for the ants to float around, but every now and then an ant lost hold of the surface and went skittering around in a Michael-Jackson-like dance, until it was able to get back down. It seemed that the ants were working so hard to stay attached to the surface that they were not able to adjust their paths to search as effectively as the ants in control arenas did on Earth. You can try the experiment yourself in gravity with your favourite ant species (Ant Colony Search); a simple arena, without the beautiful machining that NASA did, works just fine. Engineers designing robots to search a burning building, or another planet, are using systems like those of the ants, based on networks of local communication. These swarm methods can be simpler, cheaper and more robust to failure than a system using central control. If each searcher has to relay information back to a central station that in turn makes a map and tells each player what to do, sophisticated central control is required, and if it breaks down, all function is lost. By contrast, local interactions have redundancy; if one doesn’t work, another might. Local interactions regulate many natural systems. Ecological networks show an enormous variety of types of links: one organism can live inside another, stick to it, climb along it, eat it, feed it by gathering or digesting its nutrients, help it reproduce by carrying its pollen or dispersing its seeds. All organisms operate in some kind of ecological network; no living entity operates independently. Even each of our cells contains organelles joined together in an ancient collaboration among bacteria. For example, cancer, like everything else that cells do, progresses in response to local interactions. Cancer cells are the descendants of healthy ones, and they can thrive and proliferate because they still speak the local language of their ancestors. These conversations allow them to find comfortable neighbourhoods in which to metastasise, summon a blood supply, disarm their immune-system cousins, and turn off the instructions from other cells that would stop them from reproducing. Interrupting these conversations would obstruct the growth of the cancer. Relations among cancer cells account for many of the failures of chemotherapy. Tumours contain many different forms of cancer cells, each derived from a different evolutionary lineage. Even when chemotherapy wipes out detectable signs of a tumour, cancer cells can still remain. Continued application of the poisonous treatment favours the evolution of ever more resistant cells. These resistant cells, no longer competing for resources with their late, more sensitive neighbours, can reproduce rapidly, and there might be no drugs available to kill them. In the same way, human intervention in ecological networks has produced insect scourges of agricultural crops and bacterial infections that drugs cannot stop. Individuals in a population differ from each other in susceptibility. Using the same resources links them to each other by competition – what one individual eats is a loss for another. A pesticide or antibiotic assault kills all but the most resistant individuals, selecting for resistance over susceptibility. The resistant ones suddenly have the resources to grow rapidly in number. New methods are being devised to maintain both susceptible and resistant individuals in the networks of cancer cells, pathogens or agricultural pests, so that they continue to compete with each other. Integrated pest-management and ‘adaptive chemotherapy’, for example, both work to kill only some, not all, of the sensitive pests or cancer cells. They leave the rest to help suppress the resistant ones. These new forms of control take into account the local interactions that regulate networks of pests or cells. Networks come in different shapes, depending on the arrangement of links. The familiar tree-shaped network, for example, is a hierarchy. The factory owner gives orders to the manager, who gives orders to the foremen, who give orders to the workers. Evolution produced phylogenetic tree-shaped networks of ancestors and descendants. The original unicellular organisms gave rise to a huge tree of bacteria, while another split in the trunk led to our small branch of vertebrates, nestled in the batch of twigs called mammals. 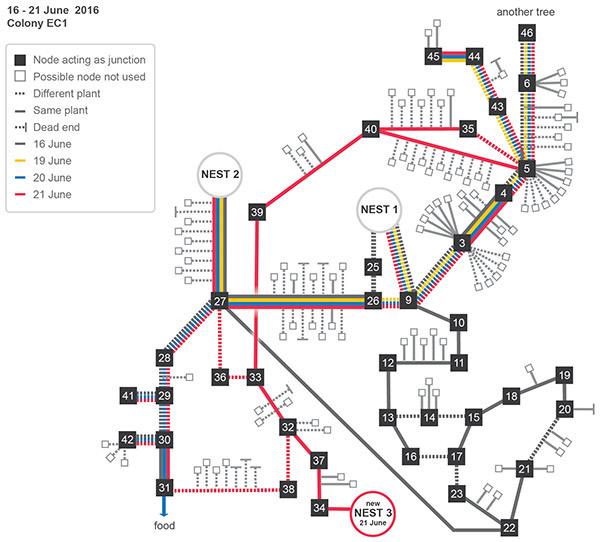 The tree and the fully connected network sit at extreme ends of a spectrum of possible network shapes. Human social life can produce complex network shapes, as any girl who has ever been to middle school knows. Two girls are linked in the network by being publicly recognised as friends. The popular girls are the hubs of the network, with many friends, some of whom are also linked to many others, while the loners or outsiders have no friends at all. In between the hubs and the outsiders, we find the girls linked to someone in the golden inner circle, but also some that have no hope of ever being noticed by the anointed. The author’s 6th grade graduation (the author is not in this photo). 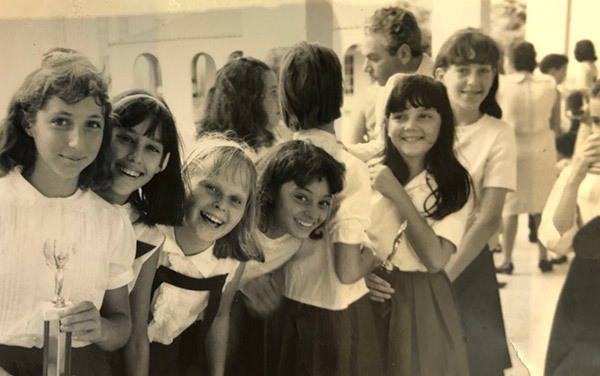 The two girls facing the camera on the right achieved high betweenness centrality in 7th and 8th grade. Photo courtesy of Marcy Licht Comerchero. Wherever a girl’s position in the network is, it can be described by how completely it is linked to the rest of the network. This is called its ‘betweenness centrality’: it denotes the number of links between all other pairs of nodes that pass through that node. The most popular girl is the one that is the most linked-in – all bonds of friendship eventually pass through her. In my middle school, understanding ‘betweenness centrality’ was so complex, and important, that one girl kept a notebook tracking day-to-day changes in the links. By diagramming who was friends with whom, it was easy to see how close each one was to the Most Popular one, the ‘betweenness centrality’ of each aspirant to the inner circle. At lunch, girls crowded round the owner of the notebook to see where their name came up that day on the list. Facebook has made many of us into middle-school girls, as its features perform all these functions, and not just at lunch, but 24/7. The software that suggests products for you on Amazon does much the same thing. For every product X that you buy, it counts up the links, the number of times that someone else who bought X also bought Y, Z and so on, and gives the products that are most often linked to X. The H index on Google Scholar, anxiously monitored by academics and reported to deans and tenure committees, is another version. Counting up these local links between scholars, when one cites the work of another, has begun to rule hiring and promotion at universities. The greater the betweenness centrality of any node, the more power over the network it exerts. In political terms, if you want to rule, set things up so that others cannot act without your permission, ie so that your betweenness centrality is very high and well-enforced. But such power can be undermined by the local; for example, climate change cannot be dismissed when everyone realises it is what they see outside the window (Land Talk), and disparate realities begin to blend when their adherents engage in face-to-face conversation. A tacit recognition of the power of a well-connected network underlies a widespread fear of ants. What is scary about ants on the kitchen counter? A moment’s reflection should reassure anyone that they are indeed much bigger and stronger than even hundreds of ants. What is alarming is the sense that the ants are all connected and working together. But ants function using networks of interactions, not as they do in horror movies, urged on to attack by malevolent leaders. Their effectiveness is not due to powerful individuals who are situated to influence the behaviour of others. Ants do very well without any identity; nothing distinguishes the hubs from the outsiders. Betweenness centrality is not important for them: an ant’s interaction rate depends only on whether it happens to run into others, and ants don’t seem to care which other ant they meet. In his novel War and Peace (1869), Leo Tolstoy argues that local relations among people, rather than the military strategy of the generals, allowed and then repelled Napoleon’s invasion of Russia. As Tolstoy pointed out, rather than following orders, people acted like ants. Highly connected networks trade resiliency for security. More connections mean easier repair, but also more vulnerability. The Internet of Things will soon let your phone direct your thermostat and coffee machine but not, it is to be hoped, your neighbour’s shower. To prevent this will require a system that allows local connections between some nearby devices, but prevents others. Ants have this problem, too. A few ant species have been observed to read the chemical signals of another species. This links the networks of both species: one finds food and lays a chemical trail; the other species hops onto the same trail, and can take the food instead. How a network changes depends not just on its shape, but on how quickly and how often the local connections shift. Neural networks, for example, form links slowly, a fact that profoundly influences human society. Neurons must grow to find others, and the growth of neurons produces the synapses that carry signals. If synapses in neural networks are not used, they get pruned, disappearing from the axon. Pruning happens much more rapidly in young mammals than in old ones; networks in the brains of babies are in rapid flux. In this way, the time course of change in neural networks shapes another network, that of the family, which is based on the obligation to protect babies while their brains are forming, until they can protect themselves. An epidemic is another form of network whose time course depends on how links are formed, as one sick person infects another. The epidemic spreads most steadily, in a widening wave of disease, when everyone is easily linked to everyone else. If a virus can live on door handles, faucets and elevator buttons, a quick touch can infect passing strangers. The movie Contagion (2011) presented a terrifyingly realistic example, based on the actual spread of SARS in 2002 from a hotel in Hong Kong, of a network of infection that spread quickly around the world. In the film, a virus proceeded from a handshake between a chef and client, to the waiter who touched the client’s glass, and on from there to everyone who touched any object any of them had touched. The first infected person went to an airport and flew to another continent, and a worldwide epidemic was launched. By contrast, when an infection requires special circumstances to be transmitted, the time course of an epidemic will be slower and more erratic. At first, there is a rapid burst in the numbers of sick people, as all the hubs, the people who are in a position to transmit to many people, infect everyone they can. After that, the disease will ooze out more slowly from those with fewer links. For example, for one person to infect another with a sexually transmitted disease, a lot more has to happen than a quick touch of a door handle, and so people vary greatly in the numbers they infect. Initially, HIV travelled quickly among people who had many sexual contacts, but then, in places where people had access to information and to condoms to prevent transmission, the virus no longer reached all the sexual partners of all infected people, and its rate of spread slowed. Vaccines slow down epidemics not just because the vaccine prevents infection, but because every person not infected does not then spread it herself. Networks in nature show how, for the networks that we engineer and those that tie us to each other, the pattern of links at the local scale sets the options for stability and transformation. Almost everything that happens in life is the result of a network. Making, or breaking, local links is the way to change.